Macmillan’s Standard Library (not to be confused with Macmillan’s own series, the Macmillan Standard Library, issued around the same time) was the result of Macmillan’s US manager George P. Brett offering the emerging reprint powerhouse Grosset & Dunlap access to 100 non-fiction Macmillan back-catalog titles to be sold cheaply (.50 cents) among Grosset & Dunlap’s successful (mostly) fiction reprints. This relationship and the series is a bit of an oddity given that a large block of one publisher’s books was rented to another publisher (G&D) who included the original publisher’s name (Macmillan) in the series name. It reflects the interest in experimenting with reprints to extract a bit more revenue from publisher’s back catalogs. In this case, G&D was undoubtedly using the venerable name of Macmillan to add gravitas to the books (G&D being a relatively new firm which focused on less prestigious reprints). Grosset & Dunlap was established in 1898 (as Dunlap & Grosset) then changed its name to Grosset & Dunlap in 1899. In its early years, G&D purchased paperback remainders and unbound leftover stock from major publishers and rebound and sold them. These books typically have the original publisher’s imprint on the title page and the G&D imprint on the book spine and jacket. By 1903 G&D was purchasing the rights to print and bind titles and would continue to do this throughout the 20th century. 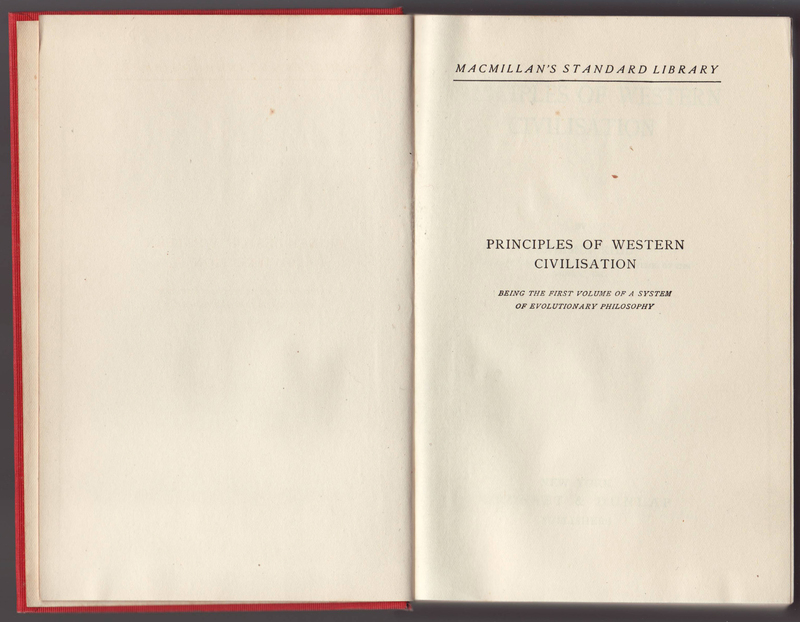 The start date of G&D’s Macmillan’s Standard Library is difficult to pin down, due to confused references in much of the literature on publishing in the United States. The first mention of the series in contemporary book publishing literature is 1912, which seems to be a viable initial date for the series. 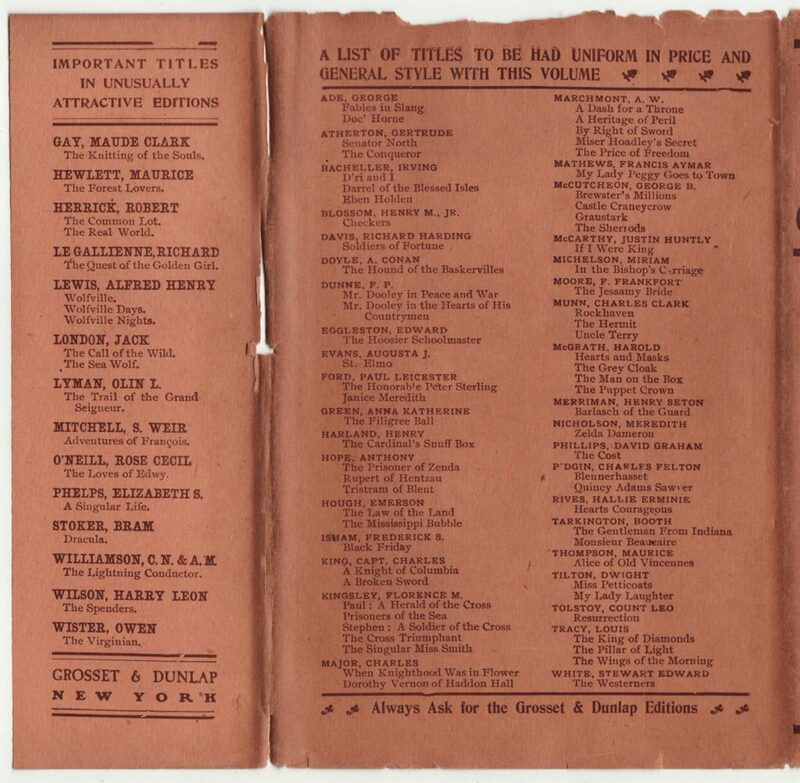 Brett offered Macmillan plates of back catalog non-fiction titles to G&D on a royalty basis, 100 titles in all, which were printed by Macmillan’s printers, Berwick & Smith, in Norwood, Massachusetts. 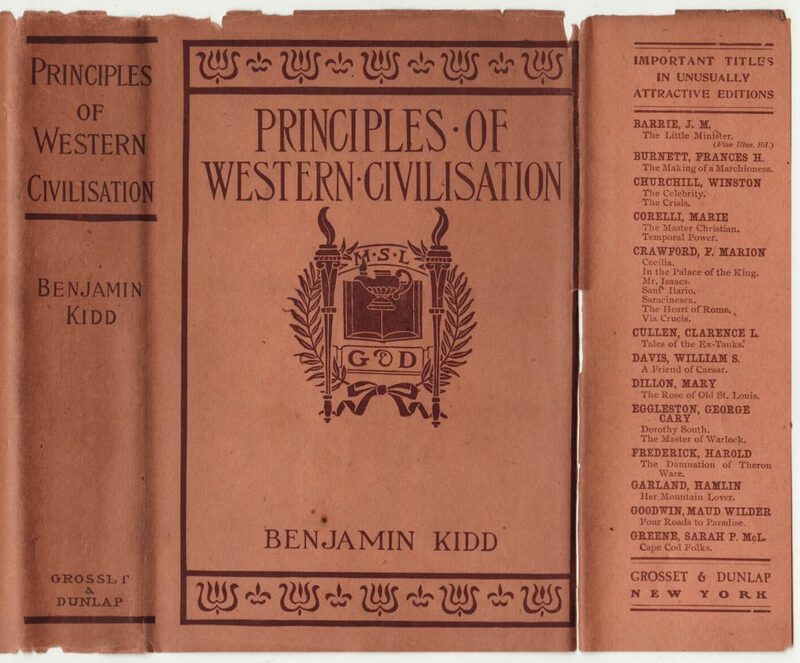 The books often contain earlier dates, including reprint dates, prior to 1912. 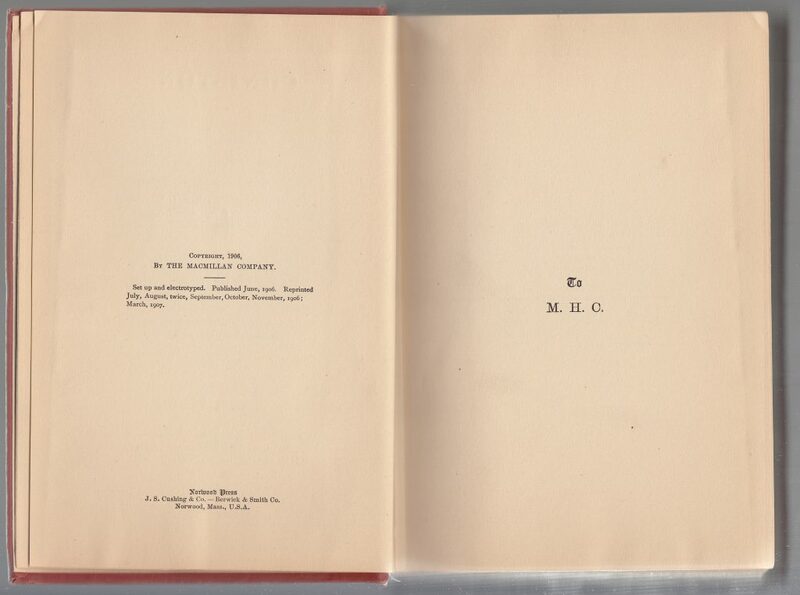 But it is likely that the books were being reprinted without any changes to the plates beyond a new title page. Thus the dates on the copyright page are from the last Macmillan printing of the book. The series was not a success. Dunlap described sales as “more or less of a frost.” Despite high hopes, sales were apparently disappointing and the series is not advertised by G&D after 1915. 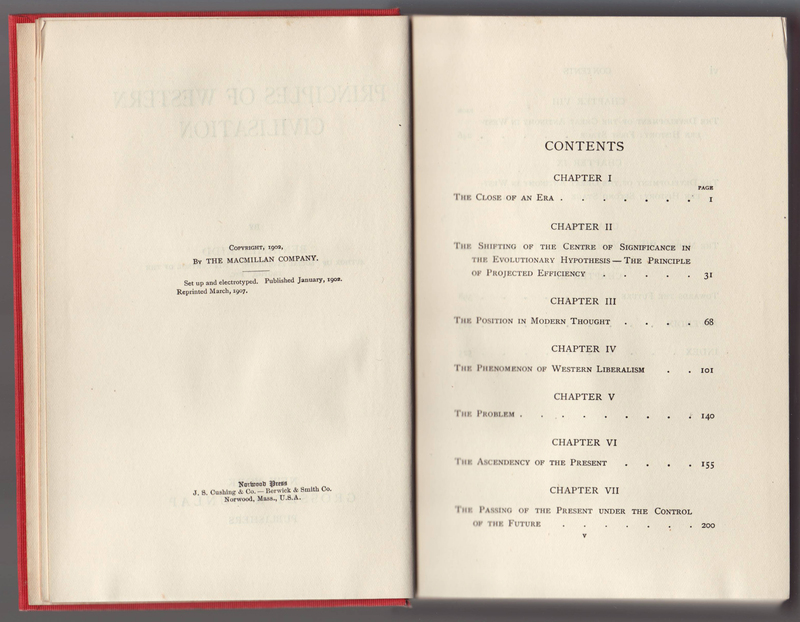 It seems that Macmillan also initiated its own series of non-fiction reprint titles, called the Macmillan Standard Library (without the apostrophe “s”) starting around 1912 and lasting until around 1915 (with a few reprints with later dates). 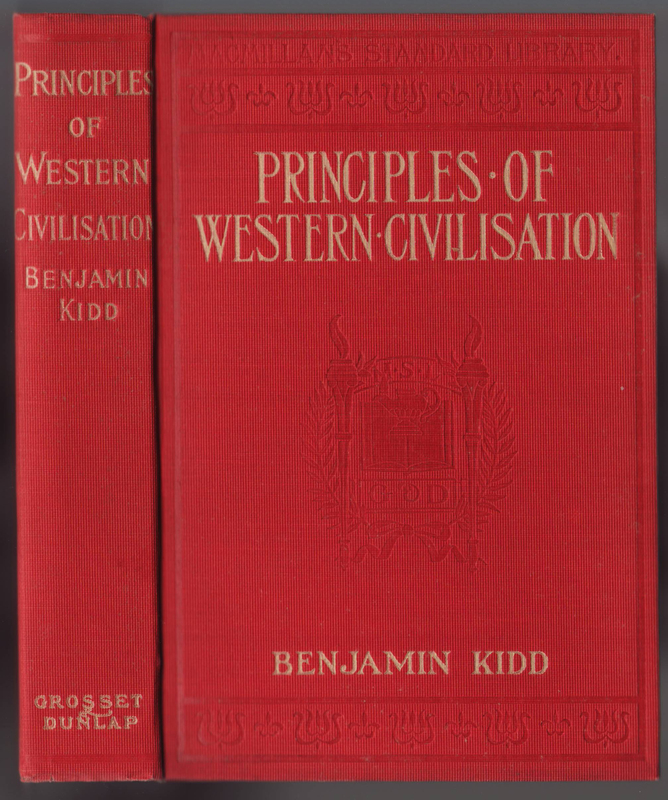 This copy of Benjamin Kidd’s Principles of Western Civilization is dated 1907 (last reprint) but is from 1912-1915, the span of the series availability. 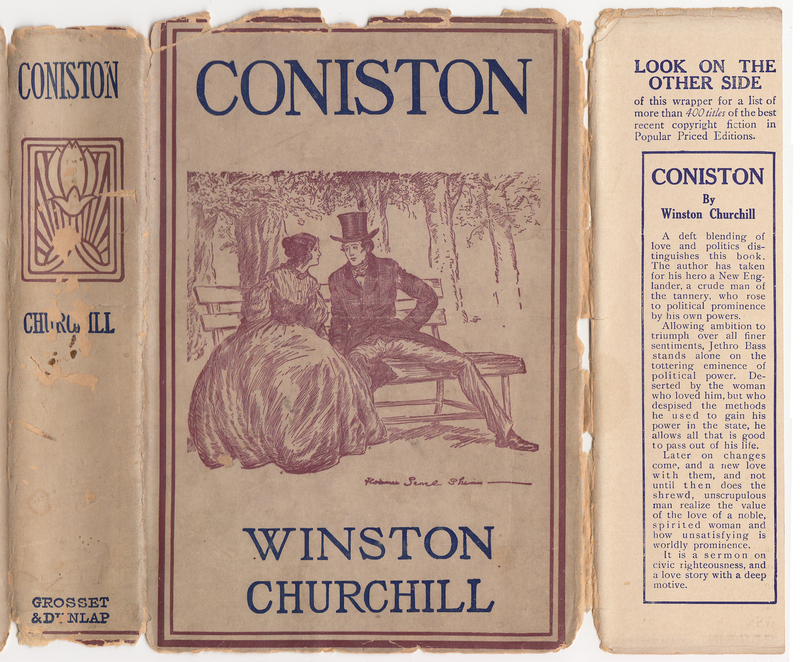 Jackets for the series are common to the series and use similar paper and general design to other early Grosset & Dunlap titles. The G&D imprint is on the spine of the jacket. The front of the jacket consists of a rather elaborate series colophon with both MSL and G&D embedded in a design built around an open book and lovely lamp of knowledge. Besides the “MSL” in this colophon, there is no indication of the series name on the jacket. A list of other G&D titles fills the front jacket flap. The additional titles fill the rear of the jacket and rear jacket flap. Bindings are nicer than average, with white printed text and debossed decorations including the series name (along the top) and series colophon (in the middle. It is a bit odd that the full, spelled out name of the series is not on the jacket – as the designs on the jacket otherwise reflect the designs on the book. The series name is included on the half-title page. The title page with the G&D imprint. The copyright, with Macmillan, and reprint dates. 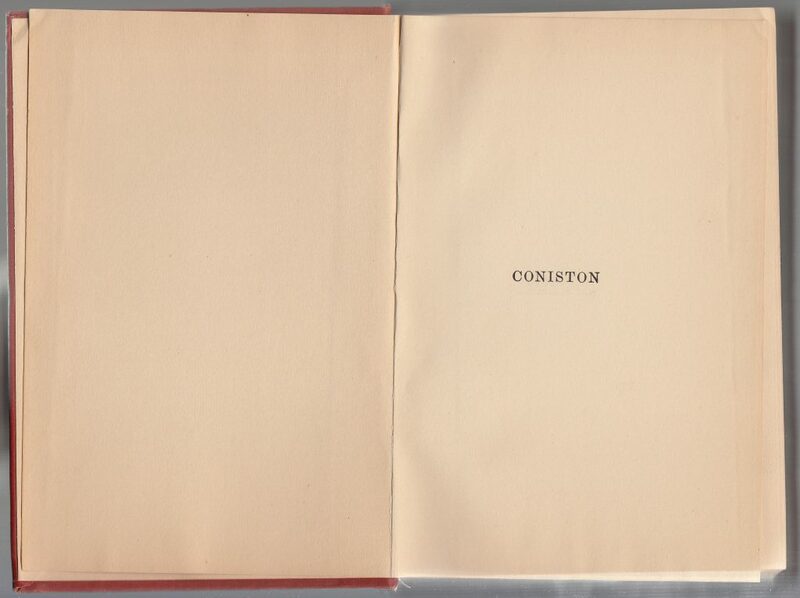 As indicated earlier, this page was probably not reset after the last Macmillan printing of this title (1907) but the series was first offered in 1912. 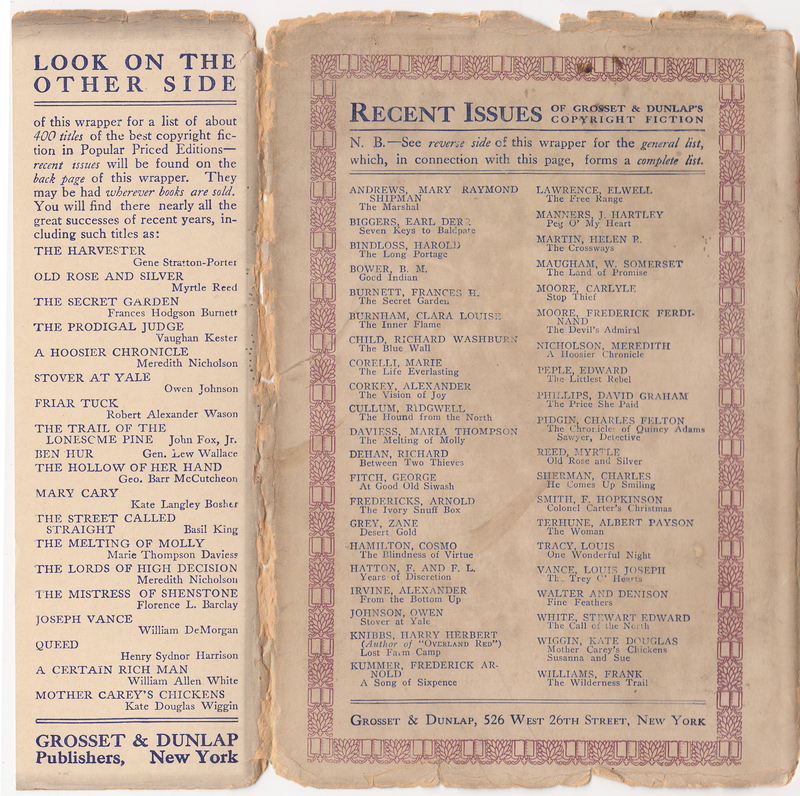 Grosset and Dunlap was a firm intent on the recycling and reuse of titles in its series. Most common, of course, was the reprinting of titles licensed from other publishers. Initial G&D titles were rebound paperback remainders (printed by other firms). This approach to recycling titles by rebinding (and adding new jackets) was another key strategy for G&D (see the entry for Grosset and Dunlap for examples). This leads to some interesting “mash-ups” of books that have some G&D components and some components from other publishers. 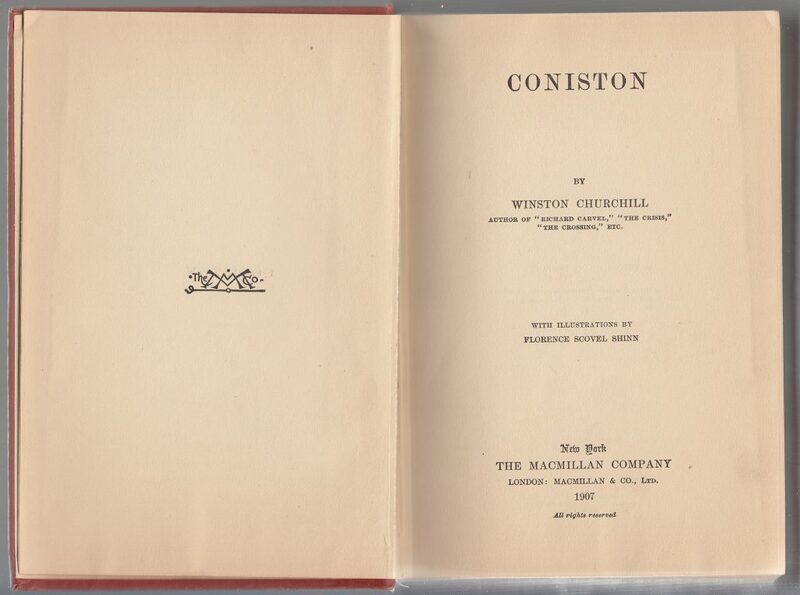 The book below, Winston Churchill’s Coniston, is by all appearances a typical G&D reprint from the 1910s or 1920s. The book, however, indicates Macmillan’s Standard Library on the spine. Inside the book, it’s all Macmillan: probably a leftover block of text bound with Standard Library on the spine, and jacketed in a regular (not Standard Library) G&D jacket. The rear of the jacket includes “Recent Issues” of titles that seem to have been first issued as reprints by G&D in 1912 – 1914. Thus the jacket was probably printed about 1914. The rear of the jacket lists additional G&D titles. The binding is lacking the Standard Library debossing and other decorations on the front. 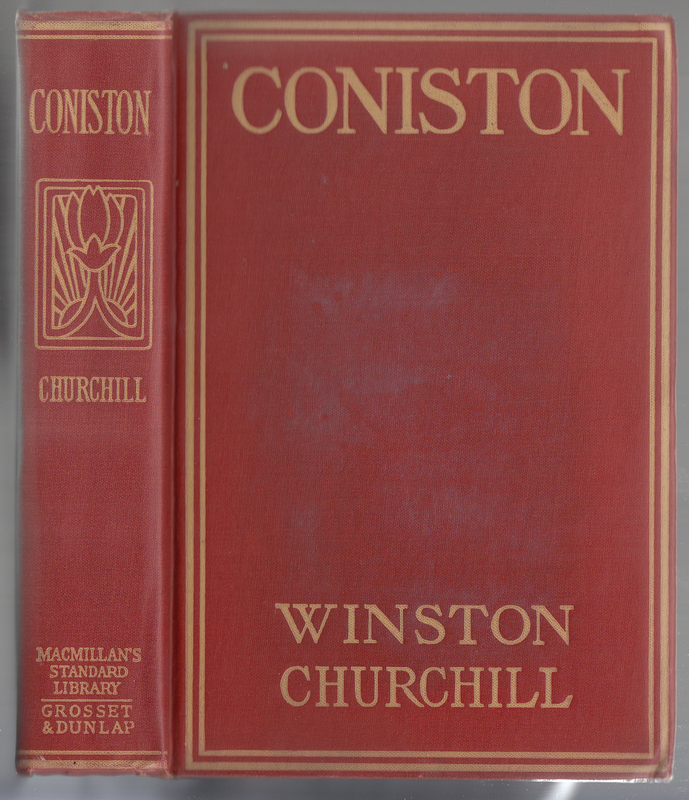 The base of the spine indicates both Macmillan’s Standard Library and Grosset & Dunlap. 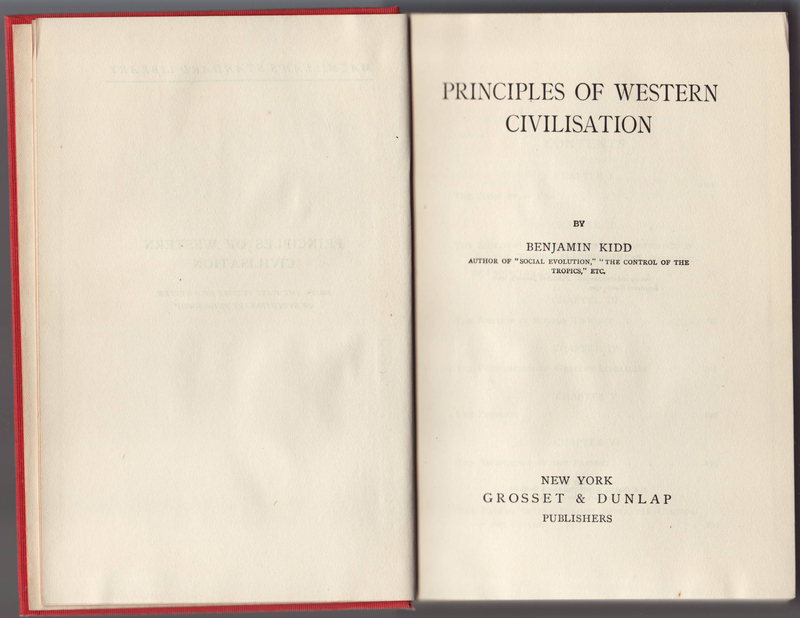 The series name is not included on the book shown above (Principles of Western Civilization). This is, then, a variant binding for Macmillan’s Standard Library. The half-title page lacks the series name (as seen on the copy of Principles of Western Civilization above. From this point forward into the book, we have a copy printed from Macmillan plates, without any changes, by G&D, or it is possible this is a rebound book, using left-over text printed originally by Macmillan and sold to G&D as loose sheets. I have seen a copy with the same binding, but a title page with the Macmillan Standard Library indication. The title page includes only Macmillan information and a 1907 date. The copyright page includes the original publication date for the book (1906) and the six reprints that year and one reprint in March of 1907 (of which this is a copy).